An edition of music, like anything else, is a product of its own time. During the 1980s, guitarists of my generation were starting to become aware of stylistic concerns in the interpretation of early music. There was a movement towards stylistic authenticity, an attempt to re-discover the original intentions of early composers and recreate the aesthetic elements that were appropriate to their music. (Many style-conscious players today no longer think of being "authentic" - a concept unattainable both in theory and in practice - and prefer, instead, to use the term "historically informed.") This growing movement is what first prompted me to research the lute music of Bach and to develop my own edition of it. I tried to find performance solutions on the guitar that were as faithful as possible to the original music and to clearly delineate the necessary editorial alterations. In particular, I attempted to preserve the integrity and independence of Bach's original voicing. I have since come to believe that sometimes I went too far and sometimes I did not go far enough in doing this: I went too far in places where the musical end-results are not justified by excessively difficult fingerings needed to achieve them; I did not go far enough when I failed to provide fingerings that bring out lines that are implicit, although not specifically differentiated in the score. (Bach did not always distinguish individual voices-especially inner voices - in his notation, to save the clutter of rests, ties, multiple stems and the like.) 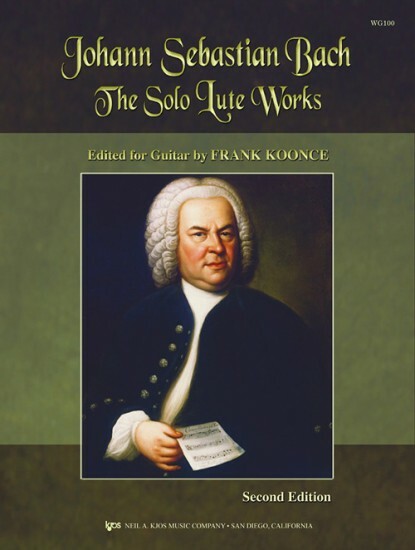 I believe that in this revised edition I have been better able to integrate the idiomatic qualities and limitations of the guitar into my transcriptions while still being faithful to the spirit and intent of the original. My goal is to blend scholarship with practical performance solutions for the guitar. I am also pleased to be able to include updated research data; a newly discovered portrait of Bach; and a facsimile of the original manuscript of the Prelude, Fugue and Allegro, BWV998 that was unavailable at the time of the first edition. Q: Is this edition spiral-bound?